Helps drivers to keep check of where timber is located and where it is to be transported to. GPSTimber provides support in decision making and helps drivers to keep track of where the timber is located and where it is to be transported to, as well as ensuring quality in timber management. GPSTimber consists of software that is installed in the office environment of the facility and of client software that is installed in every vehicle. The central software manages, in addition to data from the lorries, data from saw tables and from sorting. There is a GPS receiver in every vehicle that keeps track of the location of every vehicle. 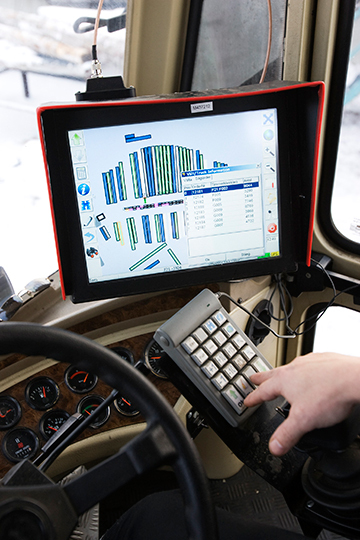 The driver uses a special keyboard to register activities and to control the software. The communication between the vehicle and the central server is wireless. The lorries continuously send information about their position and activity to the central server. Information from the lorries is compiled with information from other lorries, the saw tables, sorting, etc. Information is sent to the lorries about such features as the status of the stock, sorting status, what is to be assigned for sawing, video (optional) and more. The locations of the stock at the timber yard are shown in a graphical form on the drivers’ screens and the timber quality is indicated, among other ways, by different colours. The position of the lorry is shown in real time and the driver receives clear information on where the timber is to be collected or delivered to. The driver can also create new locations for stock directly from the lorry. The customer has considerable freedom of choice regarding the way in which information is to be displayed on the screen. Data concerning dwell time, quality, classes and much more can be examined directly in the cabin and can provide support in determining how information is to be displayed in the cabin, on maps and in text. In the office, it is possible to use different tools to examine the data that has been collected. Being able to produce historical analyses and on-the-spot accounts of the situation for the stock is one example. However, there are many more advantages than just these. Speak with us and we can tell you more. In addition to these basic functions, there has been and still is an on-going development of new functions and applications. For example: during the 2009 season, a new module was developed the permits the optimisation of sorting (classes/compartments) in real time. The timber is directed to the correct compartment in relation to distance - not to the compartment where it has “always gone”. GPSTimber is a system providing logistics at timber yards. As the name suggests, the system is based on GPS technology. With the help of communication between the headquarters and the lorries, it keeps track of what is being stored and where, where the lorries and vehicles are currently located and what activities are being carried out. The system is often regarded as being first and foremost a support for the drivers. However, it is actually a complex logistics/stock system which focuses on the drivers/users. Together with integrated data from sorting and from the production line/saw line, a complete solution is provided for production control and stock balances. GPSTimber facilitates accurate and efficient management and provides clear advantages: increased control, shorter storage times, reduced fuel costs and an improved working environment. Providing an oversight of the timber stock (quality, volumes, dwell times, etc) in real time or historically.